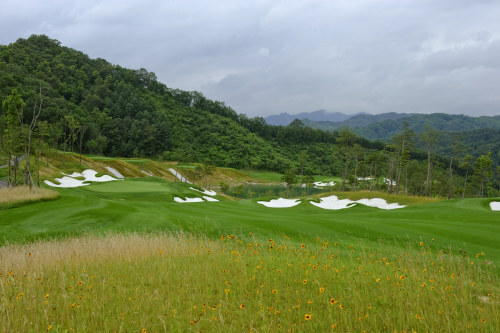 If one happened to see my earlier post, Minimalism in Golf Design, I’m sure one would agree I do not demean minimalism, in fact I’m very much an advocate of restricting change on natural golfing ground to insure the retention of as much of its character and individualism as possible. My point of the previous post was to suggest one should not demean courses that do require grading, but rather recognize them as a different form of design much as one might acknowledge differing styles of art. Over the holidays, my nephews had gotten a hold of a marketing video made by the owners of Whistling Rock in Korea. During construction of the project, a video crew would show up on occasion and follow us around the site. I hadn’t given it much thought until the glossy production was sent to me a couple of months back. Having sent a link to my sister around Thanksgiving, it had made it to my nephew’s laptops on Christmas day. In great fun, they was hooting about one clip that showed the blasting operation. “Way to go Uncle Ted…..blowing stuff up.” “Yep,” I replied, “Dynamite is the only way to go these days.” Minimalism at it’s finest, don’t you think? We knew we were likely to encounter rock at Whistling Rock well before we started construction, but didn’t know exactly where it would occur. While the blasting operation came as no surprise, this was the first time it was used on one of my projects. At first, the site looked just awful. Trekking across the property one afternoon, I froze after realizing I was smack dab in the middle of an area that had been bored with the charges already set. One of the project managers looked at his watch and told me not to worry – the blast wasn’t scheduled for another half hour. I’m sure someone yelled fire in the hole (or the Korean equivalent) 30 minutes later, but I wasn’t anywhere near enough to hear it (actually, they use sirens to insure the area is clear well before a blast would occur). As the blasting process started, we talked a lot about the idea of sculpting the rocky areas in an effort to leave some of it in place. I was a bit skeptical at first as I wasn’t sure how the residual outcroppings might look. Needless to say, I shouldn’t have worried. 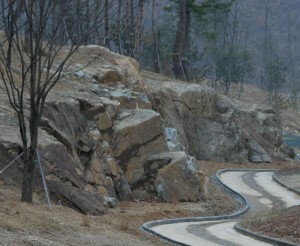 If one has ever traveled any of the new highways radiating form Seoul, it is very apparent the Korean engineers are exceptional at carving their way through mountains. Along the tee of Cocoon Two (right) is one of the first of many areas we left exposed on the project. Once it was decided the rock was work reserving, the area would be modified to accommodate it. Sometimes, we only needed to shift a cart path. 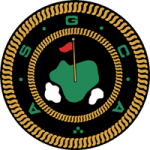 Other times, an entire tee or green would be redesigned. 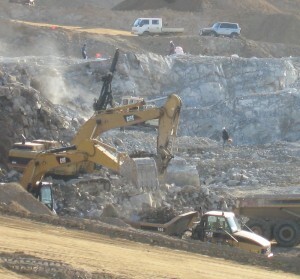 One of the added benefits of the blasting operation was the varied rock and car sized boulders it produced. These were stockpiled in an area akin to a football field so they could be used to build the water features (listening to the wind howl through this stacked field of granite one evening became the inspiration for the project’s name). 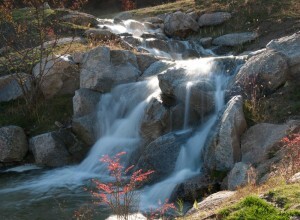 On the left is one of the many cascades built with this material. Note how the rock extends into the areas around the stream so it appears as if naturally anchored. One of the essential objectives of minimalism is to preserve the existing land form to the greatest extent possible. While blasting through rock as much as 70 feet deep is a far cry from that objective, preserving and reusing what was found certainly hints of a similar spirit. 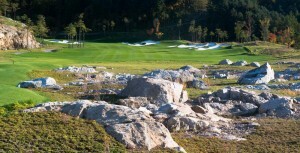 Below, a picture of the first hole on the Cloud loop, is an example of both sculpting (the outcropping to the left) and reuse (the wasteland area in the foreground). If one is an interested in viewing more of the results of this process, several other photos and the video has been posted to the website and can be found by clicking here, Whistling Rock.